Cardinals outfielder Stephen Piscotty had a great day yesterday, signing a six-year extension with St. Louis the day after beating the Cubs on national television. 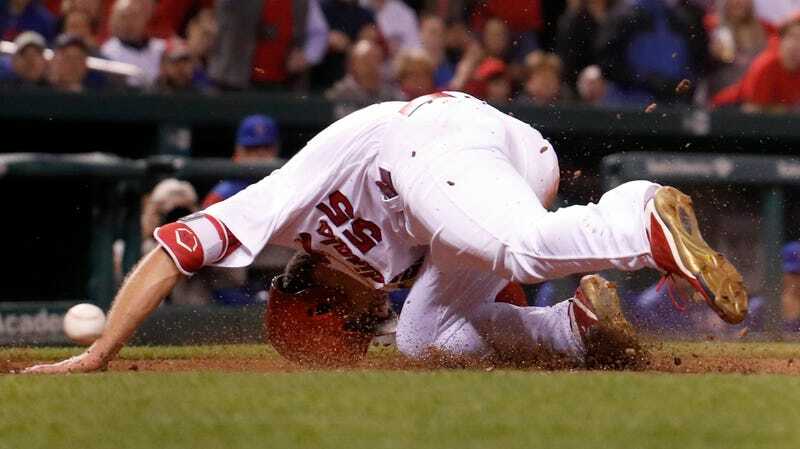 He had the opposite sort of day today, as he had to leave the Cards’ game early with a head contusion after getting hit by a trio of baseballs thrown by various Cubs players in the fifth inning of tonight’s game. First, Cubs starter Jake Arrieta nailed Piscotty on the right elbow to send him to first base. Arrieta then tossed a wild pitch past Willson Contreras and Piscotty sailed on to second base, although Contreras’s throw smacked into his right elbow as he was sliding into second. Piscotty bolted home after Javier Baez mishandled a Kolten Wong grounder, and Baez’s caught him right on the earflap of his batting helmet throwing home. Piscotty left the game and the team announced that he’d be re-evaluated in the morning. Meanwhile, the run he scored while Baez’s throw rocketed into him was the Cardinals’ sole run, and they lost, 2-1. Mike Matheny Made A Joke?